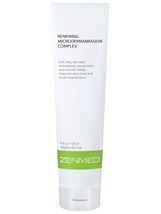 Home » ZENMED Skincare » ZENMED Renewing MicroDermabrasion Complex 4 oz. ZENMED Renewing MicroDermabrasion Complex 4 oz. Top-Rated Sellerzenmedskincare consistently earns high ratings from buyers thanks to fast shipping and excellent service. Premium Sellerzenmedskincare has been a Gold member on Bonanza since September 22, 2018. Renewing MicroDermabrasion Complex This granular formulation is based in a mineral-heavy clay designed specifically to provide intensive dermabrasion on the surface of the skin. Does not leave any residue or greasiness. Ideal for use before treatments such as the Skin Eraser as it allows for better penetration of actives. Soap-free cleansing using the benefits of smooth Montmorillonite clay. Description: Dull, flaky skin feels immediately rejuvenated and smooth. This product is ideal for use before applying any sort of treatment, serum, or moisturizer. Makeup junkies swear by this product as it smoothes the skin without using soaps so skin does not feel dehydrated or uncomfortable afterward. Concealers and foundations go on flawlessly after this effective manual exfoliator. Skin glows fresh and feels more plump. Fast becoming our TOP SELLING PRODUCT. Ideal for people with sensitivities to various cleansing agents and emulsifiers. Leaves skin residue-free. This product should be used in the evening and the use of sunscreen is highly recommended. Sun exposure should be minimized. For all skin types. Ideal for dull tone, helping Skin Eraser and moisturizer penetrate better into the skin. Helps smooth rough, uneven skin. How To Use: Step 1: At night cleanse skin and leave damp. Step 2: Apply small amounts of product to the face and neck. Step 3: Rub in gentle, upwards, circular motions. Rub each section for 30 seconds to 1 minute then move to another section. Step 4: Rinse face completely and pat dry. Ingredients: Purified Water, Montmorillonite, Ground Walnut Shells, Zinc Oxide, Glycerin, Extracts of Chamomile, Sea Kelp, Sage, Coltsfoot, Yarrow, Balm Mint, Rosemary, Althea, Wild Thyme and Horsetail, Vitamin B5, C and E, Allantoin, Algin, Glyceryl Stearate, Phenoxyethanol, Ethyl Hexyl Glycerin International Buyers – Please Note: Import duties, taxes, and charges are not included in the item price or shipping cost. These charges are the buyer's responsibility. Please check with your country's customs office to determine what these additional costs will be prior to bidding or buying. More About Customs, Duties Taxes: When ordering from.com, you're responsible for assuring the product can be lawfully imported to the destination country. The recipient is the importer of record and must comply with all laws and regulations of the destination country. Orders shipped outside of the United States may be subject to import taxes, customs duties and fees levied by the destination country. The recipient of an international shipment may be subject to such import taxes, customs duties and fees, which are levied once a shipment reaches the recipient's country. Additional charges for customs clearance must be borne by the recipient; we have no control over these charges and can't predict what they may be. Customs policies vary widely from country to country; you should contact your local customs office for more information. When customs clearance procedures are required, it can cause delays beyond our original delivery estimates.